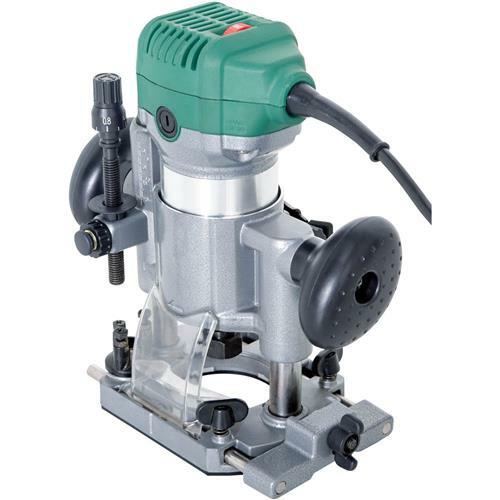 This Laminate Trim Router features a 1 HP, 6.5A motor and a no-load speed of 10,000–30,000 RPM. 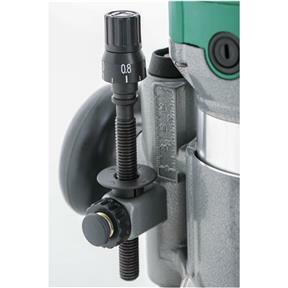 Also features an adjustable plunge depth with 3-step turret and a 1/4" collet size. 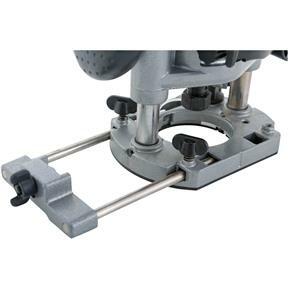 Includes micro-adjustable guide bearing, fence, fixed base, and collet wrench. Weighs 7 lbs. I have used it for several applications. It's a great little router at a great price. I looked at the Makita and they are virtually the same. Thanks Grizzly for bringing reasonable products to market. Very happy with this router. It fit my specific application and I used the fixed base on another router that had a terrible base. I am 80% happy with this product. + it is much more light weight than my full size router. + It is easier to use. - the variable speed creeps down, so that when I am routing, I lose speed, a small wooden wedge solves this. + the Plunge base does NOT seem to creep under usage and I probably will use it the most. It seems to have all the needed adjustments of a larger router. - the one base without handles creeps, so that the depth at which I am routing changes. I have not ruined any projects, as I always test before I use a new tool. While this depth change during usage is annoying, it is not sufficient to return the tool, I just tighten the base with a wrench and continue using the router. LOUD, and duzn't seem to run smoothly..
could be corded with a thin highly flexible DC power cord..
Brushless DC motor would of course be best.. This is a very good router. This is the second one I have bought (I need two). It seems to be slightly lower quality than my first one. It is quiet compared with other routers and is very easy to adjust. I am using it with a 3d router pantograph I made. I am very impressed with Grizzly customer service. Bought two. Small and light weight. Great one hand use. 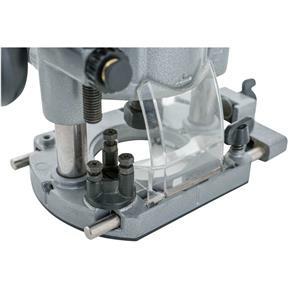 The fix base with vacuum works very well. Plunge base works great. The motor plenty of power. 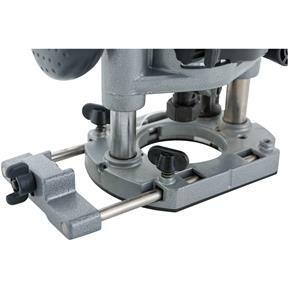 The fixbase height and base width is perfect for routing door hinges well. 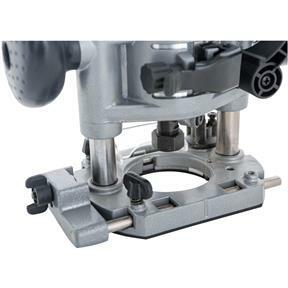 The plunge base perfect for small router bits work on electric guitars. Very pleased. Used it a couple of times and so far seems like a quality product. Got this as a gift and was pleasenttly surprised at the extras included such as the dust collector. 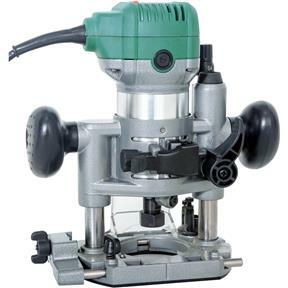 I bought this for routing and trimming when using the router table was not an option. I have not used the plunge mount, but the router works great. All this for That price?? I can afford a router set up for each operation. Time saver and repeated accuracy. I currently have two in service and will be purchasing a few more. This router is simply amazing. With simple know how and its built in features it simply out performs and out classed all of the routers I have. All at a fraction of cost. With practice, patience, and practical know how, it out preformed most all of the routers I have in shop. Easy to set and accurate for depth of cut. I can't praise this router enough even with the learning curve it's the most used router in the shop. I was a little hesitant to purchase, but so glad I did ! Great quality feel & lots of power! 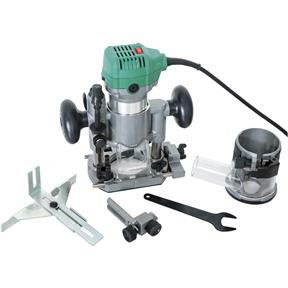 This little trim router with all the included accessories is an excellent addition to my shop. 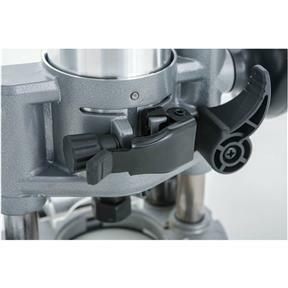 It is powerful enough to handle most small tasks without breaking a sweat. The included plunge base was a bit stiff at the beginning compared to my DeWalt router and others I own but a little bit of lubrication took care of it. 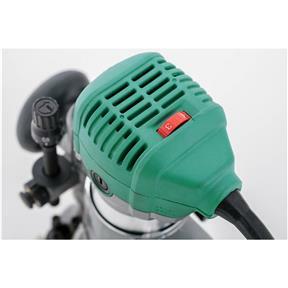 The variable speed is very smooth and might come in handy eventually but I have never missed it on my aging Bosch Colt, so it's nice to have but it wouldn't be a deal breaker if it didn't. I do however like the included template guide bushing very much, it makes edge treatment and other operations on curved workpieces a breeze. The power cord could be less stiff and longer and I will probably replace it with a longer 12' cord in the future, no big deal. Grizzly could improve tracking on shipments to Canada, but the package arrived on time and undamaged at the local Canada Post outlet - so, can't really complain. Customs charges and taxes are calculated at checkout and no additional cost apply which keeps the transaction clear and straight forward. My only regret so far is that I should have ordered two instead of one, at this price it makes sense to keep a router set up for a dedicated task.